Shelby County Deputies and Sidney Firefighters standby while a DP&L worker turns off power to powerlines connected to a pole that was struck Friday, Sept. 7, around 12:45 p.m. in the front yard of 2355 Schenk Road by an eastbound white Honda Civic. 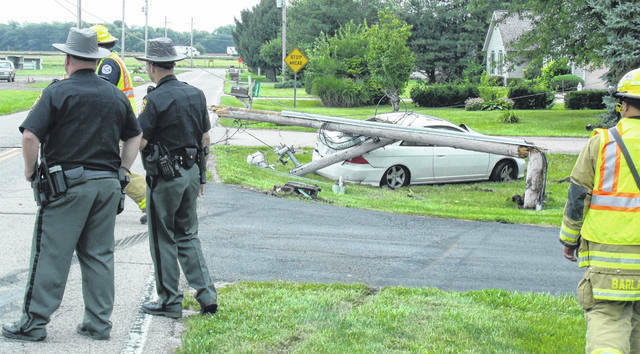 As a result of the one-vehicle crash, the utility pole split and fell on the rear of the car. The female driver was the only person in the vehicle at the time of the crash. She was transported to the hospital by Sidney Rescue Squad. https://www.sidneydailynews.com/wp-content/uploads/sites/47/2018/09/web1_crash.jpgShelby County Deputies and Sidney Firefighters standby while a DP&L worker turns off power to powerlines connected to a pole that was struck Friday, Sept. 7, around 12:45 p.m. in the front yard of 2355 Schenk Road by an eastbound white Honda Civic. As a result of the one-vehicle crash, the utility pole split and fell on the rear of the car. The female driver was the only person in the vehicle at the time of the crash. She was transported to the hospital by Sidney Rescue Squad.